St Luke's Blog: Word up! Met one of the founders of this site last night. Wordia is the Oxford English Dictionary meets YouTube, and it's brilliant. It will continue to be brilliant as more and more people get involved. It's very young and still in beta, so there's user issues to sort out - e.g. where can I see an a-z in order to browse? But on the whole it's brilliant content and they've got some really quality entries. Quentin Blake on illustration, Gary Vaynerchuck on wine, James Walsh on Melody. It's this cross of professional and user-gen content thats really appealing. 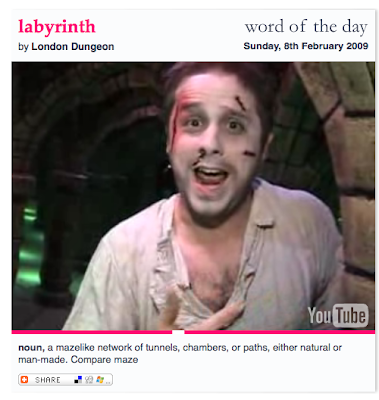 The London Dungeon has done this one about labrynths. There are still quite a few words available - can brands own some of this space?